1. Preheat the oven to 180°C, gas mark 4. Grease and line the base and sides (to 3cm above the rim) of a 23cm springform cake tin. Put the biscuits and almonds in a bag and bash to crumbs with a rolling pin. Pour into a bowl and mix with the melted butter. Press into the tin with the back of a spoon. Bake for 5 minutes, lightly beat the egg white, brush a little over and bake for 2 minutes more. Allow to cool. 2. Reduce the oven to 140°C, gas mark 1; put a roasting tin half- fi lled with water on the bottom shelf. Put the Philadelphia soft cheese, sugar, vanilla and fl our in a large bowl and, using electric beaters, slowly whisk until thick and smooth. Add the cream and mix to combine. One at a time, slowly beat in the 4 whole eggs, then beat in the 2 yolks, the lemon juice and a pinch of salt. 3. Carefully pour the mixture onto the base. Bake on the middle shelf of the oven for 1 hour 20 minutes until set with a gentle wobble in the middle. Turn the oven off; leave the cheesecake inside to cool for at least 45 minutes. Continue to cool at room temperature then chill for at least 4 hours or overnight. If it has cracked, use a palette knife dipped in hot water to push the cracks together and smooth the top. 4. Simmer the strawberries, sugar and 3 tbsp water in a pan over a medium heat for 5–8 minutes until the sugar has dissolved and the berries are soft but still holding their shape. Lift the berries out and set aside; turn up the heat and bubble the sauce for a minute to a thick syrup. 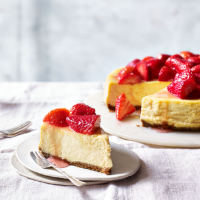 Arrange the strawberries over the cheesecake then glaze with the syrup.